Does the metaphor for coming out work out cross-culturally? What does or can family look like to LGBTQ Asians? What does it mean and how can one be an ally to the LGBTQ+ Asian community? This month’s ACAM Dialogue is focused on LGBTQ+ and non-heteronormative sexualities as well as what it means to be a queer Asian Canadian. 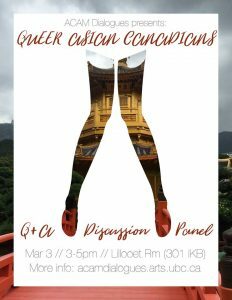 UBC students will share their experiences of navigating school, life, and their communities as an LGBTQ Asian, followed by a brief Q+A and an opportunity for attendees to engage in group discussions about current themes and topics within the Asian Canadian community. Light snacks will be provided and it is free to RSVP. Justin is a fourth-year student of French and Asian Studies. His academic interests lie in South Asian linguistics and their ties to expressions of religious (particularly Muslim) identity in the subcontinent. He is a big Mariah Carey fan and highly prefers dogs over cats. Chandima is Third year Asian Area Studies student who is interested in the intersections of religion, ethnicity and nationalism. He is also the project assistant at the CISAR. He loves Shyam Selvadurai, ice cream and cats (and dogs). Yulanda is a queer Chinese settler born on Anishinaabe territory under the Dish With One Spoon Wampum Belt Agreement. They are in her final year of the Gender, Race, Sexuality & Social Justice program with a minor in Asian Canadian and Asian Migration studies. She is a member of the student committee for the ACAM dialogues on sexual violence, a facilitator of QTBIMPOC space, and a youth organizer in Chinatown. A Virgo sun/moon/rising, Yulanda is a fierce believer in collectivity and possibility, and can be found learning and playing in spaces of magic, community, and utopia. This event will be taking place on the traditional, unceded, ancestral homelands of the xʷməθkʷəy̓əm (Musqueam) First Nation. We recognize that sexual violence plays a key role in colonial and gendered violence, and continues to affect Indigenous communities. As the land which UBC is situated on was taken without consent, we ask settlers to consider what it means to be good guests in the spaces they navigate. Along the same line of thinking through space, we are prioritizing the ACAM Dialogue as a student and survivor-centric event that centers Indigenous and POC students (particularly Asian Canadian student communities). Please be mindful of this if you plan on attending. If you have any questions or concerns about what it means to be an ally, feel free to contact acam.events@ubc.ca. This event is organized by the ACAM Dialogues: Extending the Conversation on Sexual Violence in Asian Communities on Campus and Beyond project. These dialogues examine the intersections of race, gender, and violence, especially as they impact Asian student communities and open up spaces for students to share experiences and resources, build analyses, and discuss strategies of organizing against sexual and other forms of violence. The series will culminate in a public symposium in Spring 2017 to bring these conversations to a wider audience at UBC and beyond. 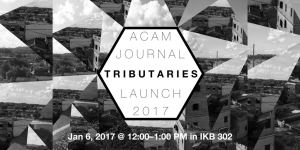 The Asian Canadian Asian Migration Studies program invites you to join us at it’s first academic ACAM journal launch. The ACAM undergraduate journal is a new student-run publication that reaches across various disciplines, genres, and forms, to consider topics around Asian and Asian Canadian identity. The journal seeks to recognize and encourage dialogue around these topics, and to grow as these dialogues continue. Submissions from all UBC students, disciplines and cultural contexts at are welcome. The inaugural issue, “Tributaries”, features collected poetry, short stories, visual art, and essays. This event will be taking place on the traditional, unceded, ancestral homelands of the xʷməθkʷəy̓əm (Musqueam) First Nation. To celebrate, you are warmly invited to our launch party from 12 – 1PM in the Dodson Room 302 (Irving K. Barber Learning Centre, UBC) on January 6th 2017. Free lunch will be provided to those who RSVP. We are also inviting contributors to read and share their work with the audience. Hope to see you there! Click here to register for this event. Lunch will be provided for those who RSVP. Please let us know if you have any special dietary needs at acam.events@ubc.ca. From East Mall, enter the Learning Centre through the main doors. Dodson Room is on level 3 in The Chapman Learning Commons. There are two good sized elevators on the lobby level (east mall entrance) that access all levels of the Learning Centre. To commemorate UBC’s Centennial, the Asian Canadian and Asian Migration Studies Program invites you to celebrate 100 years of Asian communities at UBC. The exhibition is a relational project that showcases various stories from the Hong Kong Canada Crosscurrents Project, a trailer and photos from the upcoming film All Our Father’s Relations, creative work done by students for the ACAM Student Journal, and narratives from the ACAM Centennial Alumni Project: Retelling UBC’s History from an Asian Canadian Lens. By engaging with these existing projects, ACAM hopes to foster dialogue that includes alternative histories around the UBC community. We ask how these different yet intertwined Asian diasporic histories influence the ways in which the current student body interacts with the unceded territory upon which we live and work. Join Dr. Nora Angeles, Dr. JP Catungal, and K.Ho as they discuss sexual violence in Asian communities in Canada. The audience will engage in a facilitated dialogue with the panelists as we explore how sexual violence impacts Asian communities in Canada through the context of colonization and racism. How might certain cultural codes inform sexual violence against women and LGBTQ people in Asian communities in Canada? What can these communities do to address sexual violence, keeping in mind particular histories of violence and oppression? We invite you to explore these questions and more in this engaging panel discussion with ACAM faculty, students, and friends. As well, Dr. CJ Rowe will be present to talk about support services available at UBC and in the larger Vancouver community. This event took place on the traditional, unceded, ancestral homelands of the xʷməθkʷəy̓əm (Musqueam) First Nation on March 18, 2016. Leonora (Nora) C Angeles is Associate Professor at the School of Community and Regional Planning and the Women’s and Gender Studies Undergraduate Program at the University of British Columbia. She is currently the Graduate Program Advisor of the Centre for Women’s and Gender Studies. She is also faculty research associate at the UBC Centre for Human Settlements where she has been involved in a number of applied research and capacity-building research projects in Brazil, Vietnam and Southeast Asian countries. Her continuing research and interests are on community and international development studies and social policy, participatory planning and governance, participatory action research, and the politics of transnational feminist networks, women’s movements and agrarian issues, particularly in the Southeast Asian region. Dr. JP Catungal is Instructor I (Tenure-Track) in Critical Race and Ethnic Studies in the GRSJ Institute. His teaching interests include anti-racist feminisms, queer-of-colour critique, the politics of knowledge production, and migration and diaspora studies. JP’s research develops queer-of-colour and anti-racist feminist interventions in the scholarship of teaching and learning. He is also engaged in ongoing work on racial geographies of sexual health, alignments between homonationalism and straight allyship, and queer-of-colour theorizing in Filipinx-Canadian studies. K is a queer, non-binary Chinese settler raised in unceded Coast Salish territories. They put energy into QTIPOC communities, representations, and activisms. Currently, they are facilitating a student directed seminar titled “Voices from the Margins: Critical Perspectives on Race, Sexuality, and Settler Colonialism,” focusing on women of colour and Indigenous feminisms, queer of colour critiques, and community- and art-based resistance movements. K is an editor for The Talon and a portrait photographer whose work is framed in community representation and radical visibility. CJ Rowe is a Diversity Advisor, Sexual Assault Intervention & Prevention in Student Development and Services at UBC and received a Ph.D. in Cross-Faculty Inquiry in Education in 2014. CJ’s work as a Diversity Advisor, uses a feminist intersectional approach to provide leadership in the development and implementation of the University’s Sexual Assault Intervention and Prevention Education plan. CJ’s research interests include queer theory, postfeminism, embodied pedagogy, performance studies, and women’s music.